The new policy applies to all campus community members and outside visitors and guests. That includes students, employees, consultants, contractors and visitors, as well as representatives of companies renting University-owned space or property that is owned or managed by JU. Creation of the policy, which is consistent with other higher education institutions across Florida and the nation, was the result of a JU community-wide effort that featured discussions and input from students, faculty and staff. It is aligned with JU’s new Healthy Campus Program, which promotes a culture of wellness, helps identify health priorities and advocates for policies and services supporting health and wellness. To help those who may desire help quitting tobacco, Jacksonville University’s Brooks Rehabilitation College of Healthcare Sciences has a partnership with the local Area Health Education Center (AHEC) to provide the JU campus community assistance in signing up for a free six-week Group Quit class. These classes are held at many locations throughout the community, including the Arlington area. Class participants receive the tools and support to help them begin a tobacco-free life. Each participant also receives a four-week supply of nicotine replacement patches, lozenges or gum. For more information, call the local AHEC at (904) 482-0189. This program is part of the Florida Department of Health’s Tobacco Free Florida, a statewide cessation and prevention campaign funded by Florida’s tobacco settlement fund. In addition to the Group Quit, there are other free tools available to help tobacco users quit, including single two-hour sessions, phone help and web-based help. For more information, visit www.tobaccofreeflorida.com/quityourway. Updated signage across campus will alert the JU community and visitors to the new policy. Definitions, procedures and enforcement of the new policy can be read below. Beginning Aug. 7, the same detailed policy information can be found by visiting the University Policies page of JU’s Student Handbook at http://www.ju.edu/greenpages/university-policies.php. 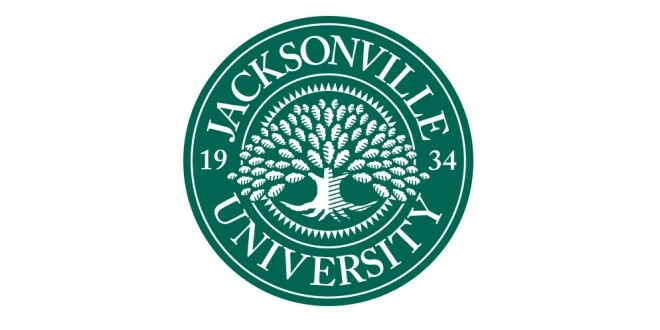 Jacksonville University is invested in protecting the health and well-being of its employees, students and visitors. 1. “Smoking” means inhaling, exhaling, burning, or carrying any lighted or heated cigar, cigarette, or pipe or any other lighted or heated tobacco or plant product, including marijuana, intended for inhalation in any manner or form. “Smoking” also includes the use of an e-cigarette that creates a vapor, in any manner or in any form, or the use of any oral smoking device for the purpose of circumventing the prohibition of smoking in this policy. 2. “Tobacco Products” means all forms of tobacco, including but not limited to cigarettes, cigars, pipes, water pipes (hookah), e-cigarettes (any device intended to simulate smoking). 3. “Members of the University community” include its faculty, staff, students, volunteers, customers and visitors. 4. “Property” includes buildings, structures, grounds, parking lots or structures, enclosed bridges and walkways, sidewalks, university carts and vehicles, as well as personal vehicles in these areas. All designated smoking areas will be eliminated. All ash receptacles will be removed. The smoking of tobacco products may be permitted for controlled research with prior approval of the Provost, the Institutional Review Board, and the Dean of Students. Tobacco use and/or smoking on campus may be permitted for educational or religious ceremonial purposes with prior approval of the Provost and Dean of Students.